Although the final count remains as yet unknown, projections based upon counted votes reveal an interesting development in the Austrian political scene. While likely that the governing parties, the SPÖ and ÖVP, will once again form the government, given the numbers thus far this cannot be seen as a forgone conclusion. Currently the SPÖ has won 26.9 percent of the vote, a fall of about 2 percent from their 2008 results, and the party’s poorest showing in an election since 1945. 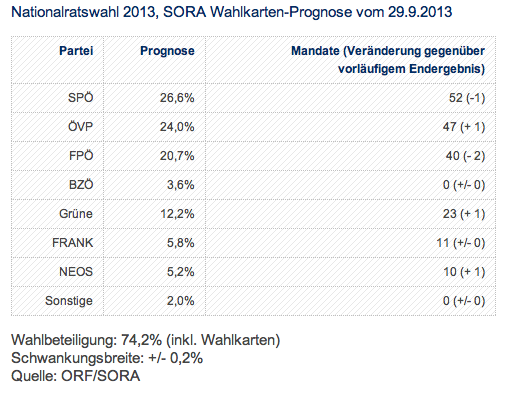 The traditional coalition partner of the SPÖ, the conservative ÖVP also saw a decline in support. Last night they won 24 percent of the vote as compared to 26.0 percent. Together the two parties enjoy a narrow majority of 50.9 percent. In spite of this ‘respectable’ result (so described by Norbert Darbaros, who ran the SPÖ’s campaign), the losses experienced by both parties correspond to impressive gains from euro-skeptic and new parties. The right-wing euro-skeptic Freedom Party (FPÖ), headed by Heinz-Christian Strache witnessed a jump in support winning 22.6 percent of the vote, as compared to 17.5 in 2008. Furthermore, two new parties entered into parliament last night – Team Stronach, the party of Austrian-Canadian businessman Frank Stronach, won 5.7 percent and the liberal youth party NEOS led by Matthias Strolz won 4.9 percent. With the success of these parties exists the possibility of a new (albeit unlikely) governing coalition. Regardless of which parties will ultimately unite to form government each potential coalition should be analyzed, as their possibility alone evidences the Austrian electorate’s desire for something new. The election results point to a change in attitude of many Austrian voters. Naturally the effect of protest voting and abstentions plays a role, but both are also symptomatic an erosion of the party intense party loyalty, which has been a staple of Austrian politics. Despite enjoying a high standard of living Austrians are unsatisfied, a dissatisfaction, which opened the door to those smaller parties last night. More important than improving transparency and accountability, voters are being attracted to different perspectives on the contemporary issues. Most notable is the support won by euro-skeptic parties, around a quarter of voters. It cannot be denied, that support for the pro-European Union position of the traditional governing coalition is wavering, many Austrians do not support the government’s position on the bailouts offered to crisis-hit countries. A trend, which may only gain more traction as Austria’s economy, specifically the banking sector, is put under ever-greater strain. Economic uncertainties have been felt more in Austria than in Germany and may explain the change in the political wind; it is a change the next government cannot easily ignore. Having dominated Austrian politics for most of the country’s post-war history, the likelihood that the grand coalition (SPÖ and ÖVP) will soldier on in spite of diminished electoral success is high. After all, during the campaign both asserted their desire to continue in their coalition should they be able to do so. The coalition would face tough negotiations as they search for the middle ground, but this challenge is not unfamiliar to the parties. Most analysts are speaking for the likelihood of the grand coalition. The results of last night created the opportunity for the formation of a new governing coalition. A numerical (not to mention political) prospect could be a partnership between the conservative ÖVP, the right-wing FPÖ, and Team Stronach. It is a possibility not yet ruled out by the leader of the ÖVP Michael Spindelegger. In reaction to yesterday’s results he commented, “This result is a wake-up call. We can’t simply go on as before” (Reuters). This assertion could suggest the party’s growing willingness to seek new coalition partners and adapt to a changing political terrain. In such a coalition the ÖVP would be the largest member, not to mention enjoy the luxury of retaining the SPÖ as a bargaining chip. Dismissed as mere political posturing by some , the pursuit of this alternative coalition may reflect the ÖVP’s awareness that a new coalition may prevent the further loss of voter support. Stagnation in the politics of the traditional governing coalition and recent scandals are pushing voters to turn to alternatives. It remains improbable that the ÖVP will abandon the SPÖ in favor of a partnership with the FPÖ and Team Stronach, however not impossible. Like a coalition between the ÖVP, FPÖ, and Team Stronach the numerical possibility of this alliance exists. However, the odds are stacked against it as the ideological distance between the three acting as an (almost) insurmountable obstacle. Such a coalition acts as a conservative fall back option rather than a serious eventuality. When the dust settles the government will likely consist of the SPÖ and ÖVP, but this does not imply smooth sailing for Austria or Europe. Debates within Austria, on everything from banking to immigration, will require careful consideration and policy choices within the country will necessarily produce international ripples. While Austrians have enjoyed high standards of living and low unemployment rates throughout the financial crisis, the country has by no means remained immune. In particular the comparatively large banking sector is struggling. Experts agree that there are too many Austrian banks that, instead of consolidating, have expanded in Eastern Europe and even the Caribbean including small regional banks that are now in trouble. Throughout the crisis the government has already spent one billion euro to save the Österreichische Volksbanken and has nationalized others. The most troubling case is that of Hypo Alpe Adria which may cost Austrian tax-payers up to seven billion euro. All together, rescuing banks could cost more than ten billion. These dimensions have caused unrest among strong private investors. A proposal to adopt a model similar to that used in Ireland to restructure banks has met with disapproval . The grand coalition, responsible for bank rescues may be forced to change its tune. Financially Austria cannot afford perpetual bailouts without risking a downgrade of its sovereign bonds and electorally, as yesterday’s results prove, neither can the SPÖ and the ÖVP. Both want to disclose the real dimension of the banking crisis after the elections. Similarly unpopular is the government’s support of the crisis-hit countries of Europe. In 2012 and 2013 the Austrian contribution to the European Stability Mechanism was 900 million euro, an unpopular choice among voters. This support helps the Eurozone remain intact, yet it has already proven costly for the grand coalition. Staring down the might of a strong Eurosceptic voice in parliament the government may have to consider altering its course. (Should an alternative coalition form government the policy on such payments will certainly change.) Austria’s economic growth and stability depend upon the economic health of its neighbors, so the government’s will to save those economies is understandable. They must now, however, address the alternative presented by the Eurosceptic parties. Migration policy is another important issue in this post-election landscape. In recent years migration policy has become stricter. A law introduced in 2006 created more stringent requirements for residency, and was another addition to Austria’s strict immigration policy. The grand coalition has been hard on immigration, but the electoral gains made by the FPÖ also suggest a radicalization of voter opinion. With an expressly anti-immigration policy, the FPÖ attracts votes from those whose main concern is an influx of immigrants and the perceived threat to job security. Internationally Austria’s immigration policy has drawn some fire, particularly due to the slow processing of asylum applications. In a Europe of open borders migration policy will remain front and center, and should we see a coalition of ÖVP, FPÖ, and Team Stronach form government the adoption of harsher regulation can be expected. Questions of immigration will also remain central as long as Turkey’s membership in the EU is in limbo. Environmental policy played no significant role in this election. Of the parties contesting the election only the Greens truly made an issue of the environment (winning approximately 11.5 percent of the vote it seems that it is not an important issue for the majority of voters). Although the environment may not have been in the spotlight of the election, it is not absent from the discourse. Both the SPÖ and ÖVP include it in their programmes, with the ÖVP making more concrete promises, including a global climate treaty. At the European level such promises may be appealing to neighbors – like Germany – given that there is political consensus about the necessity of the, “Energiewende” – the transfer to renewable energy. International environmental initiatives could create opportunities for innovation and economic growth. Unlike the SPÖ and the ÖVP the party programme of the FPÖ makes no reference to the environment. With ever more analysts claiming that European wide initiatives are crucial to the success of an Energiewende, the general lack of interest shown by Austrian parties may lead to tension at the European level. Very much like Germany after the elections, Austria will have to address tough decisions that so far have been delayed in the fields of the Euro-crisis, its own banking-crisis, and energy policies. But whereas in Germany a grand coalition may form that would face a small left-wing opposition in parliament (and the fallback option of a left-of-centre majority), Austria will most likely see a weak grand coalition facing a strong populist right-wing opposition (with a right-of-centre fallback option).